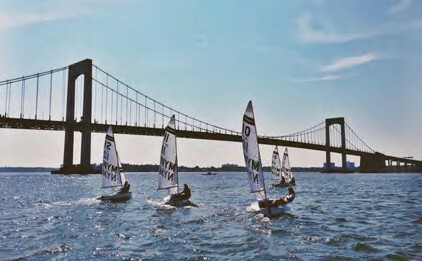 SUNY Maritime College in Throggs Neck, NY hosted 19 high school sailing teams from throughout the region for a regatta on Saturday, September 27, 2015. The teams represented Mid-Atlantic Scholastic Sailing Association District’s MDISA, NJISA and NYISA-SE leagues. Under beautiful sunny skies with gusty 10-15 mph winds from the NNE, teams sailed a W4 course in the East River’s infamous current. Maritime College’s Waterfront and Maritime Academic Center on the banks of the river provided great vantage points for spectators to view the day’s races, with the Throgs Neck Bridge, Whitestone Bridge and New York City skyline as a backdrop. At the end of the day, Christian Brothers Academy (NJ) finished in first place, Toms River North (NJ) in second and Southern Regional (NJ) in third, with all three of their A and B Division teams placing in the same order in their respective divisions. This regatta also served as the NYISA-SE League Fall Fleet Qualifier, and the top three New York teams were Mamaroneck, Bay Shore and Locust Valley High Schools. Special thanks to Maritime College’s Waterfront Director Rob Crafa, Senior Jimmy Keegan (Centerport, NY) for serving as PRO, junior Carly Mayhood (Richmond, VA) of the Maritime Dinghy Sailing team for scoring, and all the cadets who worked on and off the water to make the regatta a success. Sean Engel is SUNY Maritime’s Director of Sports Information.